Is Your Dog Itching? Is Your Cat Scratching? Is your dog itching? Is your cat scratching her fur out? STOP ENDLESS SCRATCHING AND ITCHING! VETERINARIAN RECOMMENDED BECAUSE IT WORKS! 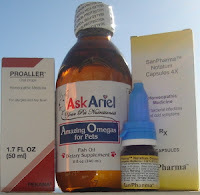 This comprehensive allergy & skin package will reduce redness,itching, hot spots, paw chewing, hair loss and also provides valuable nutrients for your dog or cat. Great for pets with allergies. If your pet endlessly chewing on paws scratching, has chronic itching, hair loss, red spots, blacked areas from licking, we can help. These three products can be purchased separately but you'll save now by purchasing together. Click here to learn more about how holistic care can stop scratching and itching!